The Gothic environs of 19th century Paris come to London in Andrew Lloyd Webber's haunting musical love story. Kelly Mathieson in "The Phantom of the Opera"
Kelly Mathieson grew up in Scotland and started ballet lessons when she was two. But after training at London's prestigious Royal College of Music, she forsook the world of actual opera to make her West End debut as Christine Daae in the ongoing Andrew Lloyd Webber phenomenon, The Phantom of the Opera, which continues at Her Majesty's Theatre in its original production. Having played opposite such diverse leading men as Ben Lewis (late of Company), Tim Howar and currently David Thaxton, Mathieson is leading a pinch-me life that is soon to include a cabaret evening where she will be seen not as the show's imperiled heroine but as herself. How does it feel to be making your West End debut in this part in this show? I feel as if I’ve been going for this in my mind from when I was six years old. I trained as a dancer and then I studied opera and that’s what I thought I was doing. When I went to the Royal College of Music, I was sure I was going into opera. But, in fact, I did some contracts with opera companies and everything felt unbelievably wrong. How then did you cross over to musicals? So many people were saying that I would be so great in musical theater if I could ever get seen for a part there. I had a friend in Phantom at the time and said to her, “Look, something feels wrong with my career now: how was it transitioning?” She was a few years above me and had also studied classically so she knew what the transition was like and she said to me. “Just send me your CV.” And the next thing I knew I was standing outside the audition door for Phantom thinking, “This is so stupid, what am I doing: I’m going to make a complete fool of myself!” But one thing led to another, and I was making my musical theater debut in my dream role. Can you trace the origins of your interest in this material? I was having singing lessons and listening to the Sarah Brightman stuff and then my mom got me the movie on DVD and I loved it; I thought it was so wonderful. Then I got an Andrew Lloyd Webber backing track and my dad, who cannot sing at all, would take the Raoul part with me as Christine. 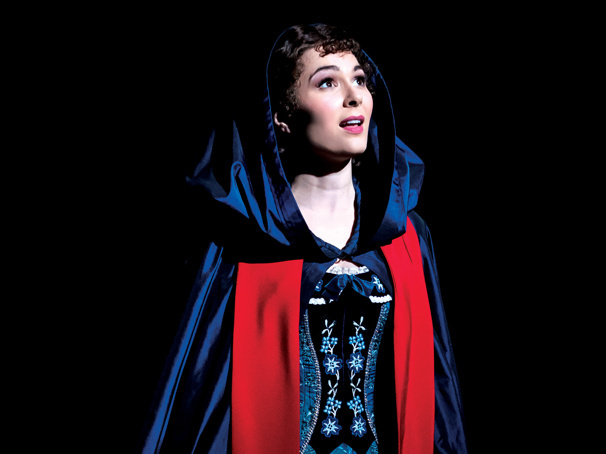 We would play it over and over and then on my 18th birthday I had a Phantom birthday cake and wrote on Facebook, “Wouldn’t it be amazing to play Christine Daae one day?” I said all this stuff thinking inside, “I’m not going to play it”; it felt like such a far-off reality. And when I went in for it, it felt like a joke—even though I had trained. How did it feel some while later when your father saw you in the part on the West End? My dad was in tears, apparently. It probably felt to him like I had grown up and didn’t need to sing this with him anymore, even though when I go home [to Scotland] he tries to make me do that. He came to see me at Her Majesty’s seated next to [then-Phantom] Ben Lewis’s wife, who started crying, and when she saw us after the show, she said, “I didn’t know why I was crying and it was because your dad was crying.” It meant a lot for my parents to see me finally living the dream. I’ve already got my tickets [for a Friday, one of Mathieson's two shows off each week from Phantom] and cannot wait. If I was appearing in a show with Renee Fleming, I think I would just cry on stage. Was it easy to decide to sign on for a second year as Christine? It was a no-brainer! When I started, it probably took me about six months to fully settle in. I felt as if I was still discovering her and there was work to be done. If I’d said goodbye to the show at that time, I don’t think I would have left satisfied. Are you looking forward to showing other sides of yourself in your cabaret appearance on April 14 as part of Live at Zedel? Yeah, totally. I’m doing it because I want to prove to people that I’m not just a Christine. Some people were, like, “Oh my God, how do you do this? You’re so used to doing the same thing with the same costume,” but I like the idea of getting to be who I am. I’m doing my journey from Scottish songs to jazz and more belty things; it should be an intimate, fun evening. Speaking of music, how did you end up naming your dog Mozart? I made my opera debut singing Barbarina in Mozart’s The Marriage of Figaro and had spent a year living in Vienna where Mozart was born so it just seemed to go from there; he’s a French poodle and is the love of my life! Have you spent much time in New York, perhaps checking out Broadway? I have been to New York but what happened was that my boyfriend [the countertenor Jake Arditti] and I had decided to go to Mexico beforehand to get in all the sun and then went on to New York afterwards in what was probably one of the worst ideas ever: from severe heat to severe cold. We had four days and I had a couple of meetings but spent most of my time doing all the touristy things, which were amazing, and not in the theater because I spend all my time in the theater here. Did you pop by the Majestic Theatre [where Phantom is playing on Broadway]? I went in to meet everyone and went backstage and had the most magical time, and if I went back it would be entirely to see stuff. I have friends who will go to New York and do matinee and evening shows all day every day. Does it feel competitive having a partner who is also a singer? What’s funny is that he studied at the Royal College of Music, as well! Jake’s been amazing with my transition into musical theater but I don’t think he will ever come into my industry at all, but that’s totally fine. He loves what he does the way I love musical theater and has been incredible with my entire journey; we have one another’s backs. Has Jake ever sung at the Palais Garnier in Paris, where Phantom is set? He’s done a lot of places but not that one yet! I really want to go to the Paris Opera and see box number five [the Phantom’s box]! Are you interested in starring at some point in the Phantom sequel, Love Never Dies? Totally 110%! I would love to do it. I don’t know if it will ever come back to the West End but I’d love to do it maybe on tour. I basically wake up and I eat for Christine and I do everything for Christine rather than myself, so it would be quite nice to see her a bit grown-up. Do you have a theory as to the phenomenal success of this show? This is such a difficult question, and I’ve answered it in so many ways. I think it starts with the music in that you might turn up and think, “I don’t know Phantom,” and you’ll then be going, “Wait, I know this music!” Plus, there’s the classic love triangle which never gets old: it’s just such a beautiful story and a beautiful show, and I think that’s why it’s still going. And I still think it’s going to outlive a lot of us: I just have a feeling it will.